Head to YouTube, it tells me to come back on the date (March 28) for Deutschland. Fast forward to said day. It's after work, its been a long (and unnecessarily fraught) day and I finally to sit down and listen to and watch the first new Rammstein material in a decade. LINK HERE TO THE VIDEO. Normally I'd post it, but just to be on the safe side. It was worth it. Guys, Rammstein are BACK! And I LOVE it! I don't even know where to start. 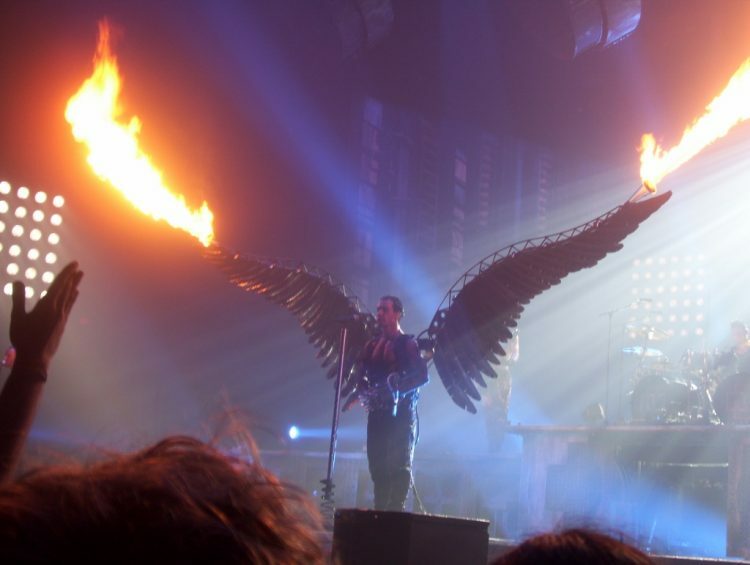 Musically, Rammstein have never suffered from an overabundance of lyrics per song. Its better to think of it more like a poem, where less can be more. In this case, looking at both the history and the future of their homeland. It's also filled with little nods and callbacks to previous videos and songs peppered throughout, from the very first word to the angelic image of Germania rising on Till's Engel wings as the band crawl like dogs below Mein Teil-style. These wings. And shameless bragging that we took this picture when we saw them in 2012. Of course, once you couple the words with the visuals, then things really shine. As always, the video is stunning, weird, disturbing, and fantastic. 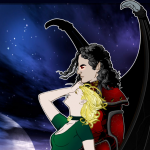 The color palette is appropriately red, black, and gold, though some parts bring in a futuristic white. 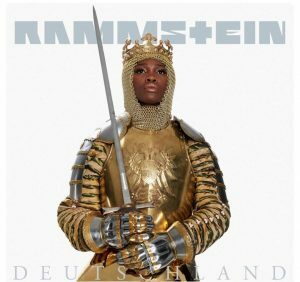 Germania is played by actress Ruby Commey, and is phenomenal, portraying the personification of her (and the band's) home country through time, from Roman invasion to now and towards the future. And the costumes are stunning. My personal favorite is the gold armor with the crown over the mail coif. So badass. Also quite nice, that view count, which is current to this writing. Leave it to Twitter for the perfect reaction meme. -Sabaton currently has a countdown on for April 2nd. As they have announced a new album for this year, I'm quite excited to see what Tuesday will bring. -We are 35 days out from the con. I do not feel prepared. We did get a few things taken care of tonight, but there's at least one kind of big thing that's posing a problem. But progress is being made. So there it is! Hopefully we'll be back again early next week talking about something similar in regards to Sabaton and a more detailed cosplay-progress post. See you then! 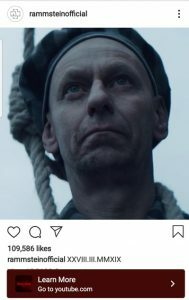 This entry was posted in Uncategorized and tagged 2019, anticipated, metal, music, Rammstein, video. Bookmark the permalink. 4 Responses to Music News! 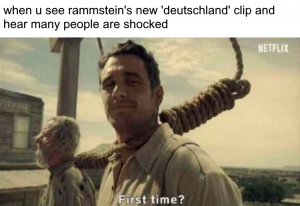 Rammstein Video Released! Long time no see Heromachine peeps!, I haven’t been here in ages felt like popping in and this post seemed the right spot for me to do just that! I am not a fan of Rammstein so I can’t honestly comment on them, but on music news this has been a good week for me, as My personal favorite band, the Japanese all Girl Pop-Rock band SCANDAL dropped not one, but two new videos this week for there new songs produced by their brand new private label they started themselves her. The Songs are titled, “Masterpiece” and “Mabataki” ( which translates to Blink ). Anyway Machiners, keep doing what you do, and maybe you’ll be seeing me popping in more if time permits! Take care all! Note that the wings articulate. Rammstein is going 25 years strong on six studio albums. 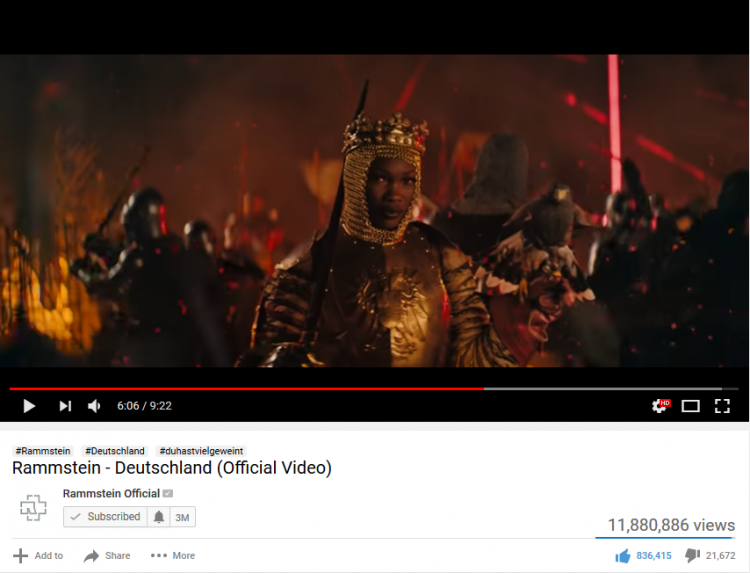 As per custom, I listened to Deutschland before watching the video. The opening just dragged. I felt that it didn’t even build to the hard-hitting yet terse body. Then it drags again into a slow death fade. While the video is visually stunning, the song loses its identity even further into the background. The video succeeds in presenting German history “at a glance.” The song and the video are meant to start conversation. The vision of the future is unnerving. Germania gives birth to a pack of dogs. Domesticated ones at that. 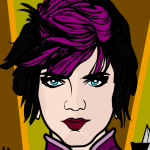 She dies. Her exquisite corpse laid to rest in a glass coffin then sent into the void. Which to me symbolizes that Germany is lost if her people deny their history.